When I go into my Local Comic Shop today to pick up Wonder Twins #3, there's something else I'll be taking a look at. For the second week in a row, DC is releasing a reprint of an event story that contains some Booster Gold. In fact, Booster has very important role in The Death and Return of Superman Omnibus. He named Doomsday. 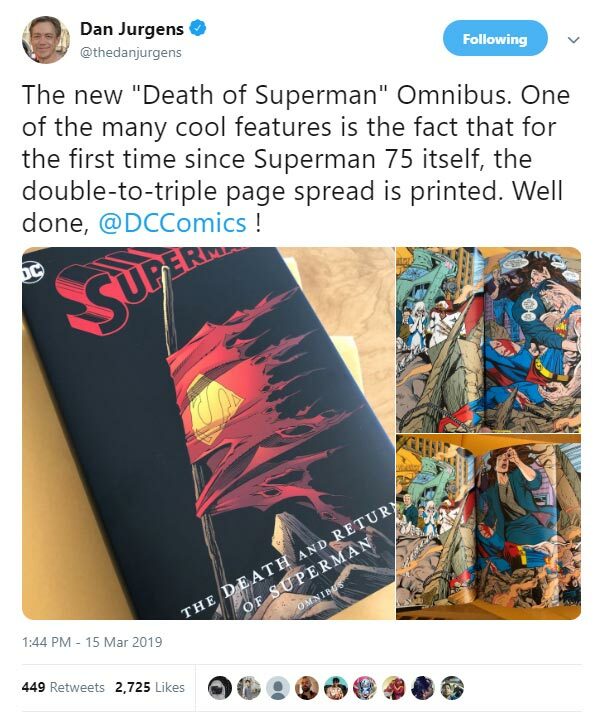 It's good to know that these omnibuses are reprinting the comics as they were originally intended to be read. That's cool, DC. Good for you. If you had two Booster Gold autographs and Booster gave you ten more, how many autographs do you have? If you had nine dollars and then spent six dollars on Booster Gold comics, how many dollars do you have left? Though Heroes in Crisis seems to get all the column width around here, Booster Gold has appeared in two other titles in the past two weeks. Granted, they aren't major appearances, but they shouldn't be ignored. First up: The Flash #65, as spotted by Shawn Baston. As you can see, Booster has only a cameo appearance as a face (with the collar!) 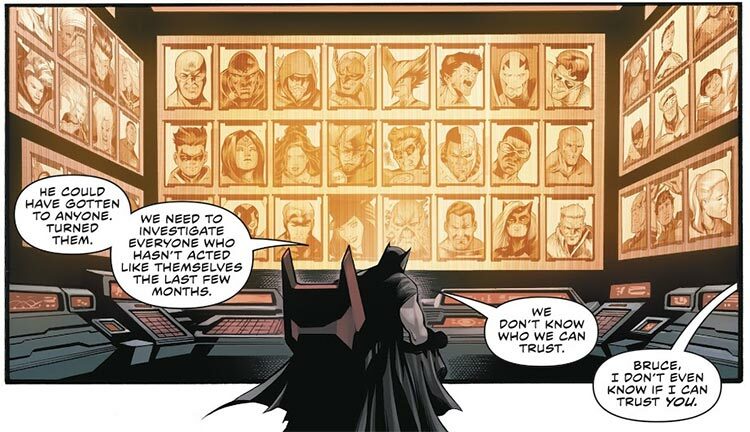 on the Batcomputer as Batman tries to decipher who else could be working with his enemies. Hmm. Booster Gold has been behaving oddly recently. Could it be...? Nah. Not our Booster. 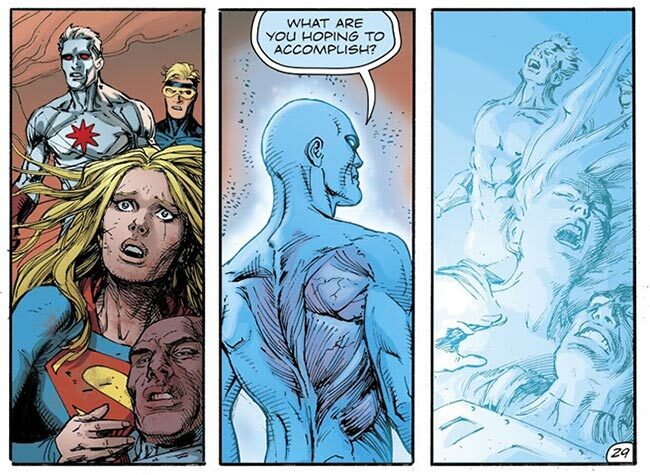 Taking place sometime after the conclusion to Heroes in Crisis, nearly every hero in the entire DC New Universe travels to Mars to confront Doctor Manhattan, who has the power to transform reality and may have killed Superman. We'll have to wait for Doomsday Clock #10 in April to see if our hero survived. Keep your eyes peeled, everyone. Booster Gold could be anywhere! Just picked up this issue yesterday and saw Booster. I didn't let you know fast enough. If you had three Booster Gold autographs and Booster gave you three more, how many autographs do you have? If a villain held six hostages and Booster Gold freed five of them, how many hostages remain? 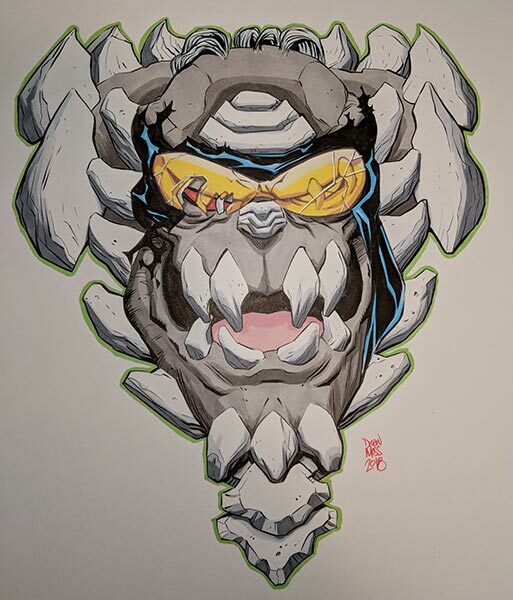 Last week, Russ Burlingame shared his latest commission from Drew Moss on Twitter. If you ask me, it's pretty terrifying. One of these days, Booster Gold is going to get the better of Doomsday. I hope I'm still around to see it. If you owned three Booster Gold comics and then bought four more, how many total comics do you have? If a villain held ten hostages and Booster Gold freed ten of them, how many hostages remain? 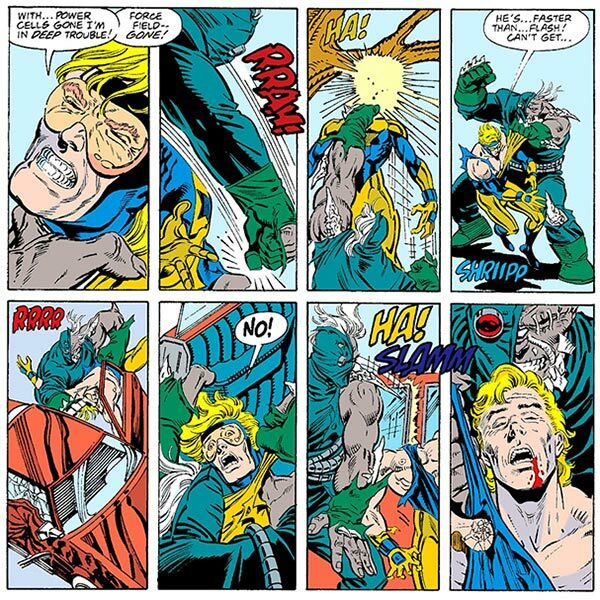 Instead, the honor belongs to our "celebration" of the most important comic event occurring exactly 25 years ago October 20: the beating of Booster Gold by Doomsday! Booster boosters will recall that it was Booster Gold who named Doomsday. Judging by how he treated our hero in return, it seems Doomsday didn't much care for it. Perhaps he would have preferred "Brother Love." Thanks for visiting Boosterrific.com in 2017. Let's make 2018 even better. If you owned five Booster Gold comics and then bought nine more, how many total comics do you have? If a villain held ten hostages and Booster Gold freed nine of them, how many hostages remain? This Day in History: Rrah! Shriipp! Slamm! It was 25 years ago today that Doomsday killed Booster Gold. I mean, Doomsday, a creature powerful enough to kill Superman, punched a defenseless Booster Gold in the face then crashed his head into a tree then slammed his neck in a car door. If Micheal Carter was human, he died three times that day. How did Booster Gold survive this beating? Credit the advanced healing technology of S.T.A.R. Labs, if you like. Personally, I have another theory. 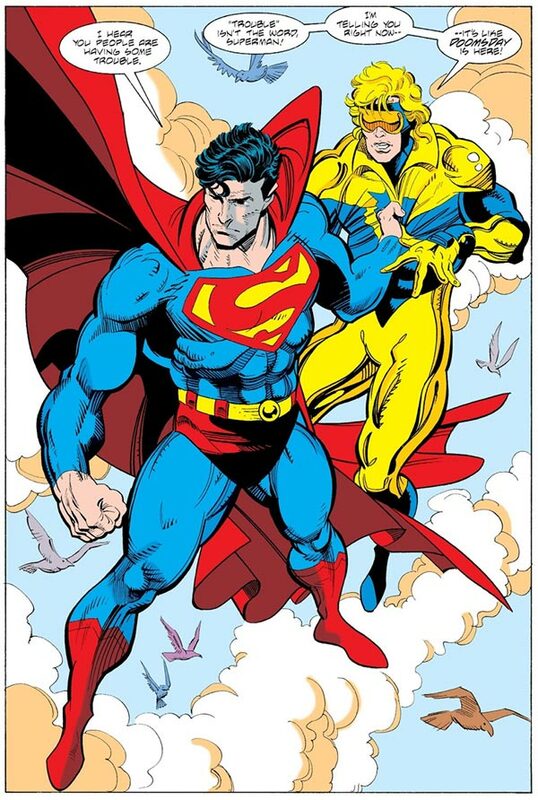 Booster boosters may recall that in Booster Gold Volume 1, #25, Harbinger told Martian Manhunter that Booster Gold was a descendant of the Guardians' evolved "chosen" in Millennium. This presumably gives Booster an unusual genetic makeup, a fact later confirmed when it saves Booster from Monarch in Extreme Justice #14. That's right, I'm saying that Booster has an accelerated healing factor! Snickt! Or maybe Doomsday was only playing around. However it was that Booster survived, "Death of Superman" was a pretty good story. It's hard to believe that it was written a quarter of a century ago. If you owned two Booster Gold comics and then bought six more, how many total comics do you have? If Booster Gold had five costumes and Doomsday destroyed four of them, how many costumes remain?